This award winning 2014 helmet design is functional and innovative. 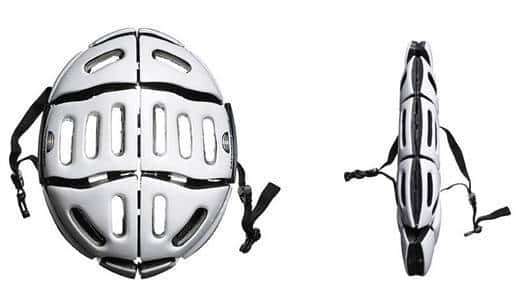 It is more portable than any helmet that has thus far ever been produced. It folds down small enough to be stashed in a briefcase or backpack when not in use. This helmet is called the Morpher and it was invented by Jeff Woolf of England. A very convenient development for bike riders everywhere. Traditional helmets are very bulky and can be very inconvenient to store. This is a real nuisance for people who like to ride to work etc. It can be difficult to find somewhere to store such a large item. Jeff Woolf was inspired to design this helmet aftr an accident. He was clipped by a car while riding his bicycle and the helmet he was wearing saved his life. He later noticed that many people who participated in Londons bike share program did not where helmets. A lot of people who don't wear helmets are either unable or unwilling to because of the difficult shape. This amazing helmet solves that problem. The transformer of helmets.